Let's ride! The ALC 2017 training season is officially underway. And we start our season in Las Vegas with a classic route ... and with two options, one with a bit of climbing, and one with a bit more climbing. Red Rock Canyon is one of the most popular cycling destinations in the entire Las Vegas area, and for good reason. 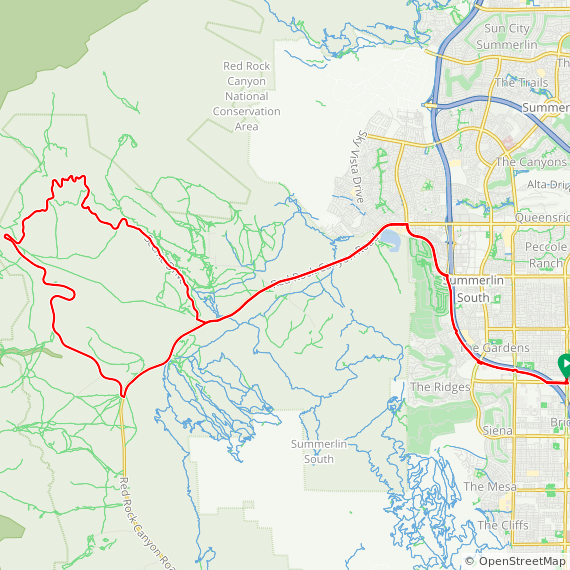 Today we'll start in southwest Las Vegas and head up the I-215 trail for a few miles before we pick up Charleston Blvd. to head west out of civilization and into the canyon. We'll slowly climb most of the way -- nothing too terribly steep, and if the wind is just right, you might not even realize that you're climbing much at all. When we get to the entrance for the 12-mile Red Rock Canyon scenic loop, you've got an option. You can head just a couple more miles up the main highway, turn around at the canyon overlook, and head back to Las Vegas the way you came. That will give you a ride of about 23 miles and about 1,300 feet of climbing. Or, if you've got a few cycling miles under your belt, you can tackle the scenic loop, return to the canyon overlook, and rejoin the 23-mile riders back to Las Vegas for a total ride of about 34 miles and a more robust 2,500 feet of climbing. The scenic loop contains some moderately steep climbs and descents and is for experienced cyclists. McGhie's won't be open early in the morning when we ride out, but park and meet in the back of the parking lot away from the main entrance. Look for the black pickup truck with all the ALC stuff! Several gas stations and mini-marts with toilets, food, and water are nearby. You don't have to be registered for ALC 2017 to join us on our training rides! In fact, we hope that after you've ridden with us, you'll be motivated to join us for the main event from San Francisco to Los Angeles next June ... registration for ALC 2017 is still open.